Why prune shrubs? Pruning is important for a variety of reasons. Pruning can help control the size of a shrub, direct growth, influence flowering or fruiting, rejuvenate old, overgrown plants, or maintain plant health and appearance. Pruning also encourages growth below the pruning cut. In addition to pruning, selecting shrubs that are suited to your environment and location are very important. The ultimate height, spread, and growth rate should be taken into account when selecting shrubs for landscaping. Thinning: This technique is the most common and best way to renew a shrub. Thinning preserves the overall plant shape and is particularly useful for shrubs that sucker from its base (see diagram). Re¬move interior branches with loppers or a pruning saw back to the base of the plant or the point of origin. Remove only 1∕3 of the largest branches at one time. Heading back: Heading back can be used to reduce the height of most types of shrubs. 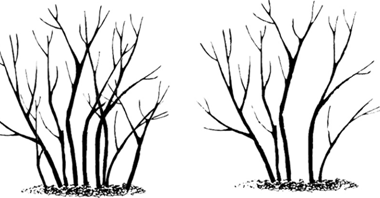 This technique entails removing each branch back to a larger branch or bud. When pruning back to a bud, cut the branch on a slight angle to within ¼ inch above the bud. DO NOT leave a stub. Disinfect your pruning tools with alcohol or a 10% bleach solution after each cut to avoid spreading diseases. Wound treatments are not recommended and can actually slow down wound closure. Rejuvenation: Use this technique for shrubs that are overgrown or leggy, and for shrubs that sucker readily from the base. Cut the entire shrub back to a height of four to 10 inches from the ground when the shrubs are dormant. Shrubs that can tolerate rejuvenation pruning are butterfly bush, Annabelle hydrangea, potentilla, and Japanese spirea. hedge shears. For most shrubs, shearing will eliminate the shrub’s natural form, will reduce the amount of foliage and flowers in the shrub’s interior, and will cause a proliferation of shoots that will make the shrub unsightly. Pinching: This technique involves the removal of shoot tips allowing for additional side branching. Pinching increases the bushiness of a shrub. This type of pruning can be done on smaller shrubs in spring, or on certain evergreens. Deadheading: This technique involves the removal of spent flowers by hand. For some shrubs such as Japanese spirea, deadheading can encourage a second flush of flowers. Broad-leaved evergreens: Broad-leaved evergreens require little pruning. Most grow very slowly. If pruning does become necessary, selectively prune branches back to a side branch so that the foliage hides the pruning cuts. Broad-leaved evergreens should not be sheared or cut back into older, non-leafy areas as these plants lack latent buds. New growth is initiated from terminal buds. Examples of broad-leaved evergreens are rhododendrons, evergreen hollies, and Oregon grapeholly. Spring-flowering shrubs: Spring-flowering shrubs produce flower buds on one-year-old wood (wood produced the preceding summer). Therefore, you should prune these shrubs AFTER they have flowered in spring, but before the next year’s flower buds are set. If you prune these shrubs in winter or early spring, you will remove many of the flower buds. Spring-flowering shrubs that sucker readily from the base benefit from thinning (see above). Examples of spring-flowering shrubs are lilacs, forsythia, viburnums, honeysuckle, chokeberry, mock orange, and weigela. Summer-flowering shrubs: Summer-flowering shrubs produce flower buds on new growth in the spring. Prune these shrubs when they are dormant or in early spring before budbreak. If you postpone pruning until late spring or early summer, you will remove many flower buds. Examples of summer-flowering shrubs are hydrangeas, roses, Japanese spirea, rose-of-Sharon, potentilla, and smokebush. For more information on pruning: See UW-Extension bulletins A1817, A1771, A1730 and University of Wisconsin Garden Facts XHT1013, XHT1014, or contact your county Extension agent.